For amateur & professional use this can be effective control against flying and crawling insects such as houseflies, clusterflies, fruitflies, mosquitoes, wasps, moths, fleas, bedbugs, ants, cockroaches and stored product insects including saw-toothed grain beetle and adult grain weevils. 25m3 for bedbugs, ants and cockroaches. 1. Consider how many fumers you need for the room to be treated (consult rate of application). Heavy infestations may require more than one application. 3. Place canister(s) spaced out on the floor surface on a heat resistant surface e.g. a plate on top of a sheet of aluminium foil 50cm x 50cm. IMPORTANT: THIS PRODUCT MAY EMIT SOME SPARKS UPON IGNITION. CAUTION MUST BE TAKEN WHEN LIGHTING THE PRODDUCT. 4. Make the area to be fumigated as smoke tight as possible by closing all windows etc. 5. Open canister(s) and light the fuse on the canister furthest from your exit point first, then light the next fumer and move towards your exit point. Close the door on exit, it is not necessary to seal the door with tape. 6. Leave for at least 2 hours but preferably overnight and then ventilate the room thoroughly. 7. 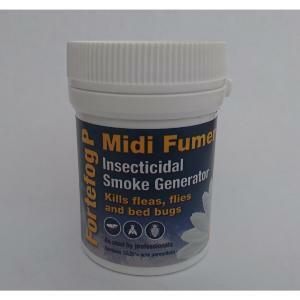 For severe infestations fumigate 3 times at 5 to 7 day intervals.